Since its inception in 1925 as an integral part of the UK air defence system, the primary role of the Royal Observer Corps (ROC) was the recognition and identification of hostile aircraft. 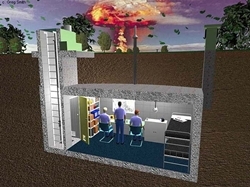 With the start of the cold war and the increasing threat of nuclear attack in the 1950's, the ROC was given the added responsibility of reporting nuclear bursts and monitoring fall-out which necessitated the construction of 1563 underground monitoring posts throughout Great Britain & Northern Ireland. To give fall-out protection, the new 'monitoring rooms' would be constructed underground, usually at the same location as the aircraft monitoring post which usually took the form of a pre-cast concrete (Orlit) or brick room often raised a few feet off the ground to aid visibility. At a few sites the aircraft post was more humble consisting of railings either round a grassed area or a low concrete plinth. Where the position was not suited to the new fall-out role the post would be re-sited, sometimes several miles away. After exercises during 1956 and 1957 showed the inadequacies of the existing monitoring instruments, the Fixed Survey Meter (FSM) was introduced in 1958. The indicator unit was mounted on the table and connected to the surface by cable running through a pipe on the end of which was fitted the ionization chamber. Unlike its predecessor the Radiac Survey Meter No. 2, the FSM could be operated from within the underground post and could read up to 500 roentgens per hour increasing to more than 5000 R/hr if the ionization chamber was withdrawn down the pipe. The Bomb Power Indicator (BPI) was introduced at the same time, consisting of a baffle plate mounted on a steel pipe at the surface. At the base of the pipe, in the monitoring room, an indicator unit with bellows was connected to a pointer. The air over-pressure from the blast would pass down the pipe to the bellows with the dial showing pressures of up to 5lb/sq in. The third piece of equipment was the Ground Zero Indicator (GZI) which consisted basically of a pinhole camera with four holes facing the cardinal compass points. A piece of photographic paper was placed in-front of each hole and in the event of a nuclear burst, the image of the fireball would be projected through one or more of the pin holes. From these, the bearings and elevation of the burst could be calculated. The GZI was mounted on a convex metal plate, usually located on top of the vent shaft next to the entrance but it necessitated somebody emerging into the open air to retrieve the sheets of photographic paper! All posts were also issued with hand operated �Secomak� or �Carter� sirens and maroons. The sirens were for sounding the �red� warning (a rising and falling note) indicating an imminent air or missile attack and the �white� warning (a steady note), indicating �all clear�. With the approach of radioactive fallout the �black� warning was sounded by maroon with a series of three explosions at close set intervals. Communications between posts and Group HQ's was by GPO telephone lines (A line of telegraph poles half way across a field are often still visible and give the site away) and in 1964 the conventional headset and microphone was replaced by 'Tele-talk' an 8 inch square box containing microphone and amplifier. In case of emergencies, all Group HQ's and one post in each cluster were equipped with VHF radios and radio masts, these posts being known as master posts. By the 1960's with the increased nuclear threat and the diminishing likelihood of a conventional air attack, priorities changed with the Corps' major role being the reporting of nuclear bursts with only designated areas of eastern England receiving live training in low level aircraft recognition and reporting. By 1965, the RAF no longer required the service of the ROC in this capacity and the few remaining overground structures were abandoned. Early aircraft observation posts were little more than sand bagged emplacements or wooden huts and these rarely leave any trace, but during the war more substantial buildings of concrete or brick were built and these sometimes survive alongside the new underground monitoring room. Post war aircraft observation posts were sometimes built of brick but many sites received the standard Orlit Posts (The Orlit post was constructed of pre-cast concrete panels forming a rectangular building 10� by 6�8". The building was spilt into two sections, the entrance door led into the smaller roofed section which was used as a shelter and store with a sliding door into the open section which housed the post instrument and chart on top of a wooden mounting. There were two types of Orlit, the Orlit �A� was at ground level and the Orlit �B� was raised on stilts to 4� 6" with a wire ladder for access. The Corps' nuclear role however remained of major importance and regular training continued. In January 1968, the Labour Government decided the threat of a nuclear attack had lessened and as part of massive reductions in defence spending, the future of the ROC looked uncertain as other home defence services were being abolished or curtailed. On the 18th January, a Home Office minister made the following statement in the House, `The ROC will be retained as part of the warning and monitoring organisation. It has the task of warning the public of an imminent attack with nuclear weapons and subsequently to warn them of nuclear fall-out. The organisation also has the ability to provide more detailed information, particularly on fall-out, to services, which can make use of it. Therefore we are making an exception to the general principle of winding up volunteer organisations although there will be some re-organisation and reduction to secure economies.' Nation-wide, the strength of the Corps was to be reduced from 25,000 to 12,500 resulting in the closure of more than half the underground posts. Prior to this reorganisation, there were no limits to the number of Observers, all volunteers, manning any one post but after 1968, each post was limited to a maximum of 10, comprising a head or chief observer, leading observer who was also the post instructor and 8 ordinary observers. This allowed for three shifts but in reality this number was often difficult to achieve with some of the out of the way posts struggling to attract the minimum compliment of 3, with observers from other neighboring posts standing in when required. The three observers on duty at any one time were numbered 1, 2 & 3. No 1 Observer was in charge of the post and was responsible for reading and accessing the information from the GZI and the BPI. No. 2 Observer was in charge of communications, checking the GZI & BPI readings, reading the FSM and filling in the post log and reporting the readings to group headquarters. No. 3 Observer had the unenviable job of changing the photographic paper in the GZI and was responsible for the domestic side of the post. National exercises (WARMON) involving the whole Corps were held twice a year, usually 8 hours on a Sunday. International exercises (INTEX) were held once a year and involved linking up with other warning and monitoring organisations throughout Europe. These lasted for 24 hours, usually 9 a.m. Saturday till 8 a.m. Sunday involving several changes of crew. There were also 1 or 2 Corps exercises a year, which usually consisted of a re-run of a previous WARMON or INTEX. Cluster meetings were held once a month where all the observers from each cluster would get together and individual post meetings were held theoretically 39 times a year. In practice a fully manned post often met weekly or even more regularly so long as the annual budget for such meetings was not exceeded. The purpose of these meetings was for training, and testing the equipment, phone lines etc. but in reality they often only consisted of post maintenance or occasionally on a cold winter evening a social get together in a nearby pub. Following re-organisation the closing of approximately half the underground posts inevitably meant a less detailed fall-out picture. A third and final re-clustering took place during the 1980�s. Regular training continued through the 70's and 80's but in 1991 it was decided by the Home Office & MOD that the ROC would cease active training and the remaining underground posts were closed at the end of September that year. Most of the posts closed in 1968 reverted back to the original landowners while those closed in 1992 were put out to public tender. Nationally, many were snapped up by cellular telephone operators because of their strategic positions on high ground.